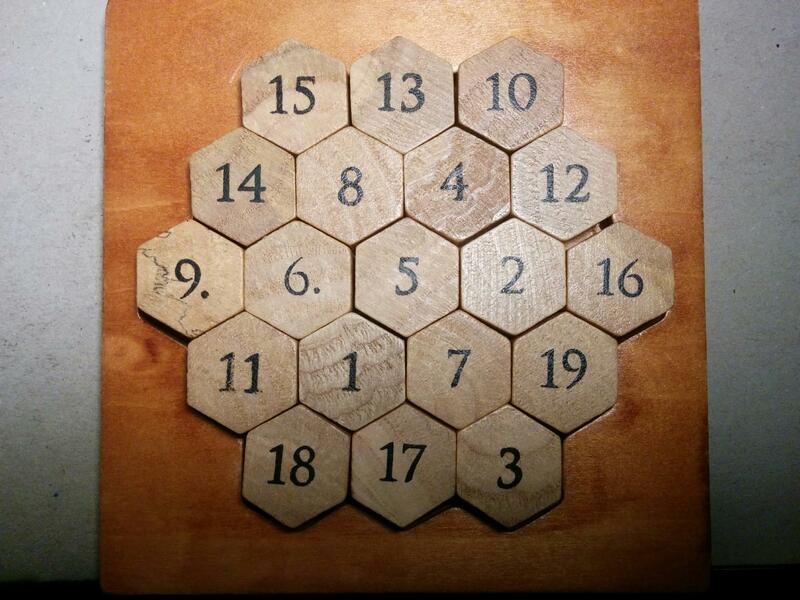 I recently got a new wooden puzzle. And while it's usually fun to try to solve it manually, it's also very tempting to think of a way to solve it programmatically. This one doesn't escape the rule. And since it's about numbers and additions, seems to be even more suitable to "computational brute-force". There are 15 rows and the goal is to make every row add up to 38. Which corresponds to 15 equations, with all the numbers between 1 and 19 inclusive. Rather than copying the equations manually one by one, let's have a function that does it automatically given a board layout. 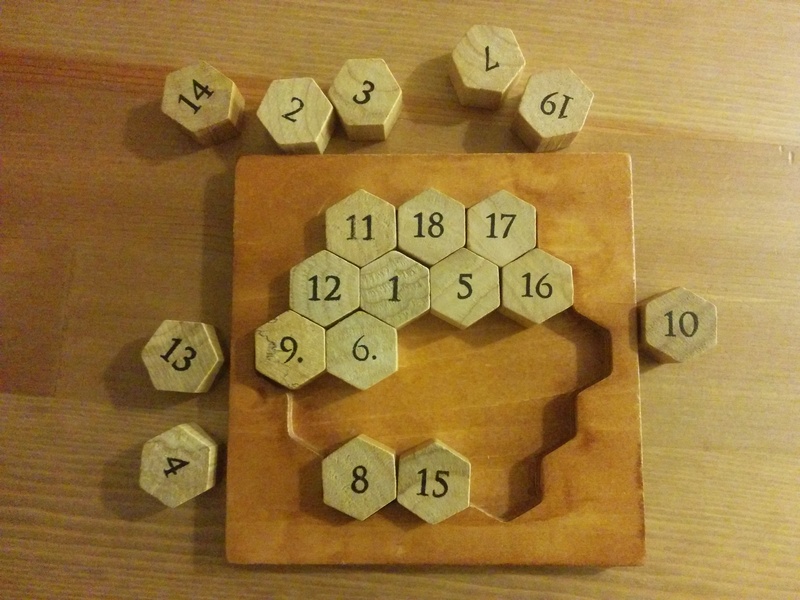 Let's also define a function to print the solution with an hexagonal shape, so it's easier to visualize with the wooden puzzle. There are a few ways to solve puzzle. In our case, we will look at two different approaches: stochastic and exact. Start from a random board. Constantly swap two pieces and see if we are getting closer to the solution. Sometimes, keep the new board even though it doesn't look better at first, because it might get better later (escaping the local minima). Let's first represent the system of linear equations as a matrix. We can build on top of that and implement the simulated annealing routine. Yes, we found a solution, even though it took some time. Numpy makes it handy to do matrix multiplications, but comes at a cost with lots of time spent creating arrays over and over. Another thing to notice: the parameters for the simulated annealing routine (temperature decay, minimum temperature...) were choosen after a few tries and influence quite a lot the time it takes for the algorithm to terminate. There is another way to tackle the puzzle, in a more exact and predictive manner. 1978419655660313589123979 configurations with repetition of numbers. Needless to say that it is too big. Fortunately, brute forcing is still possible if we can prune many branches early when some of the equations are not met. The first line is full, but the numbers don't add up to 38. In that case there is no need to continue placing the 16 other pieces and the branch can be cut early. The recursive search implements the trial and error idea. The find_all parameter can be used to continue the search beyond the first match. The program terminates rather quickly compared to the stochastic approach. However, we notice that the first number is a 3, which means that it was still the beginning of the search. One speed improvement is to first check the equations with only 3 numbers, as they will fail the test quicker than equations with 4 or 5 numbers. Same result, but much faster! Now that all the tools are defined, we can let the program run a bit longer to find other solutions, which will for most of them only be symetries of the one found above. Using the simulated annealing approach, we found one solution and stopped the program. It was quick to implement and didn't require deep thinking. It was however easily stuck in local optima, with most of the equations equal to 38 and a few equal to 37 or 39. It also required quite a lot of parameter tweaking (number of iterations and temperature decay) to get the program to converge fast. The second approach has the advantage of finding all the solutions rather quickly. It requires a bit more analysis and a better representation of the problem, but speeds up the search significantly. Regarding the execution speed, the Python program takes 12 seconds to output the 12 solutions, which is reasonnable. I implemented the same logic in C++ just by curiosity (available here), and the program terminates in a fraction of a second. If we want blazing fast programs, it is always possible to use a more adequate programming language for that!